A certified emergency nurse commonly treats patients while they face a life-threatening crisis. They are most likely to be involved while an illness or injury is still in a critical stage. They must be able to operate autonomously and reach important decisions quickly. Beyond the emergency room, they often play an important role in educating and supporting patients and their families during a critical medical situation. The Board of Certification for Emergency Nursing (BCEN) sponsors the certification exam for emergency nurses. The BCEN reviews current practice every five years and incorporates any changes into future exams. The Certified Emergency Nurse exam is based entirely on practice within the United States. Prepare with our CEN Study Guide and Practice Questions. Print or eBook. Guaranteed to raise your score. Get started today! The actual Certified Emergency Nurse test is administered by Applied Measurement Professionals sites, and it must be scheduled at least five days in advance. The computer-based Certified Emergency Nurse exams are administered at 170 AMP Assessment Centers throughout the United States. Participants can take the exam on weekdays or on Saturdays. Before taking the exam, participants must first become a registered nurse. This usually involves obtaining a bachelor’s degree in nursing. In earning this degree, students will study several key areas of nursing, including many situations frequently faced by a certified emergency nurse. The Board of Certification for Emergency Nursing (BCEN) accepts exam applications on line. Persons who meet the qualifications receive a handbook and a letter of authorization. Participants are allowed three hours to complete the computer-based multiple-choice exam. The exam includes 175 items altogether, but 25 items are pretest questions which do not count on the current exam. CEN Flashcards. 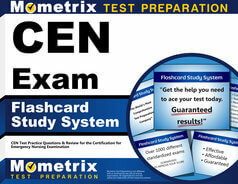 Proven CEN test flashcards raise your score on the CEN test. Guaranteed. A passing score is about 75 percent, and the grade is available right after the exam has been completed. Participants should allow four to six weeks to receive an ID card and certificate. The Certified Emergency Nurse certificate is good for four years. Tools that help the renewal process include the normal computer-based exams, continuing education, and Internet-based testing. Explore our free CEN review provided by Mometrix. Check out our premium CEN study guide to take your studying to the next level. If you benefit from these materials, just click the link below! To compliment our CEN book, we also offer extensive flashcards for even more CEN exam prep help. We hope you enjoy our products! Your purchase helps us make more great, free CEN certification content for test-takers just like yourself. What is the CEN certifcation? Certified Emergency Nurse (CEN) certification gives credentials to nursing students wanting to become employed as an emergency nurse. How much does it cost to take the CEN? The CEN exam costs $230 ($370 for non-members of ENA). How do you become CEN certified? 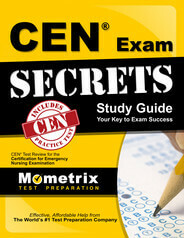 To become CEN certified, you must first pass the CEN exam. To qualify for the exam, you must hold a current RN license in the U.S.
Is the CEN exam all multiple choice? Yes, the CEN exam consists of 175 multiple-choice questions, 150 of which are scored. How long do you have to take the CEN? Test-takers are given 3 hours to complete the CEN exam. How do you sign up for the CEN exam? To sign up for the CEN exam, visit the Board of Certification for Emergency Nursing website. What is the pass rate for the CEN? The pass rate for the CEN is 61%. What is a passing score for the CEN exam? To pass the CEN exam, you must answer 106 questions correctly out of 150.